A leading innovator in the field of thermal analysis – vital in many fields of advanced manufacturing – has teamed up with the University of Huddersfield for research that will lead to the development of a number of completely new analytical techniques. 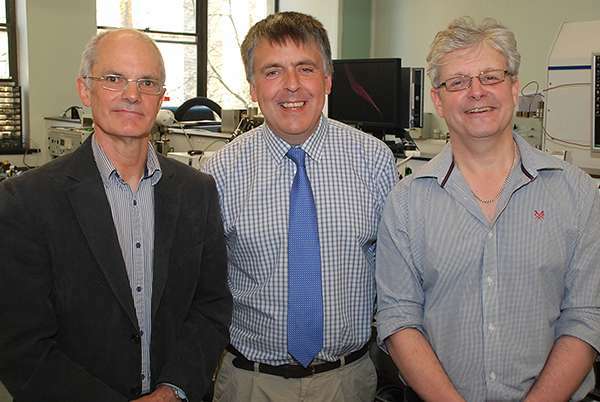 "It will be used, for example, to understand the ways in which the dissolution behaviour of solid pharmaceutical formulations depend on the way these formulations are prepared," said Professor Rob Brown, who is Director of the Materials and Catalysis Research Centre in the Department of Chemical Sciences. He is one of the University of Huddersfield scientists involved in the collaboration with Professor Reading. "The TASC algorithm, as incorporated into the system marketed by Linkam, will be further enhanced as a result of the University of Huddersfield collaboration, but it already has unique capabilities," said Professor Reading. "It enables the measurement of transition temperatures to be carried out on a very small scale in a precisely-defined place," he said. Crucially, the TASC system enables the user to analyse the effects of heat on different parts of composite materials, which normal thermal analysis techniques do not allow. Professor Reading is delighted that he and his company Cyversa have forged a partnership with the University of Huddersfield, which, he says, has "a culture that is so supportive of innovation". He himself has worked in both the industrial and academic sector and has a long track record as an inventor in the field of thermal analysis and imaging techniques.